Tata Motors has introduced the all-new Tigor facelift in India at a beginning price of Rs. 5.20 lakh and it has surely got a bunch of upgradations. The Tata Tigor facelift is now officially available in the market. It is been only a year and a half since Tata introduced the Tigor in the market but the company considered it to be wise to provide the Tigor a light facelift and all-new features with respect to regenerated attentiveness in the car and also provides inspiration to Tata’s sales in the occasion of the festive season. The Tigor which is already a sophisticated car comes with a few cosmetic modifications along with a hold on all-new features as well. Everything you want to know about the all-new Tata Tigor facelift of 2018 will be explained here. The all-new Tata Tigor facelift comes with Length of 3992mm, Width of 1677mm, and Height of 1537mm along with the Wheel Base of 2450mm and Kerb Weight of 1100-1130 Kg. The Tigor facelift has 4 numbers of doors which make it a car with a seating capacity of 5. Tata Tigor facelift comes with a modified front end containing new grille which is diamond shaped with chrome bits in it, along with all-new projector headlamps of dual-chambers that comes with chrome finish as well. The fog lamps present on the bumper of the car has chrome accents as well and the car has new 15-inch dual-tone alloys which make it look premium. The car contains a LED high arranged stop lamp and crystal-inspired LED tail lamps as on the rear windshield, at the rear. The Tata Tigor is better than before according to the looks overall. The cabin of the Tigor contains the infotainment system, all-new leatherette upholstery along with fabric installed on the door trims, and satin chrome accents on the air vents. The cabin is now covered in color scheme of black and grey, adding the premium look to the car inside also. Tata has launched a new trim of top-spec XZ+ which has a new 7-inch infotainment system from Harman which is suitable for Android Auto along with video playback in it as well. The Tigor facelift also contains a reverse-parking camera along with guideways which makes it simpler to park in and getting out. Rest of the features consists of auto folding wing mirrors and a totally automatic temperature control system which is electrically adjustable. The car also has a cooled glove box with driver’s seat which is height adjustable. In its boot, the Tigor can shift up to 419 liters of luggage. The Tigor facelift comes with ABS with EBD as standard fitment and dual airbag. The car also has a framework which is augmented with high strength steel. For the driver, there is also a seatbelt reminder. Additional interior features of the all-new Tata Tigor are Interior Lamps with Theatre Dimming, Dual Tone Interiors with Premium Finishes, LED Fuel Gauge, Trendy Body Coloured Air Vents, Collapsible Grab Handles, Trip Average Fuel Efficiency, Door pockets with bottle holder, Gear Shift Display, Coat Hook on Rear Right Side Grab Handle, Ticket Holder on A-Pillar, LED Temperature Gauge, Chrome Finish on Air Vents, Segmented DIS Display2.5, Premium Knitted Roof Liner, Gear Knob with Chrome Insert and Tablet Storage Space in Glove Box. Additional comfort & convenience features of the car are Adjustable Front Head Rests, Rear Power Outlet, Electrical Boot Unlocking, Speed Dependent Volume Control, One Shot Down on Driver Side Window, Tata Smart Manual, Steering Mounted Audio Controls, Tata Service Connect, Voice Command Recognition and Digital Controls For FATC. 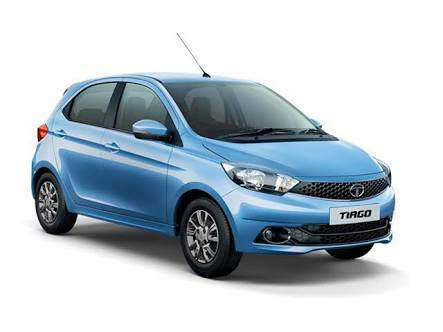 The all-new Tata Tigor facelift comes with the same 1.05-litre Revotorq diesel and 1.2-litre Revotron petrol engine. The petrol engine generates 84 bhp of maximum power and 114 Nm of highest torque while the diesel engine generates 69 bhp of maximum power and 140 Nm of highest torque. The Tigor also comes with same driving modes along with an AMT option for the XZA trim, which is the petrol trim of top-spec. The diesel variants do not have an AMT, just a 5-speed manual. The Tigor has 3-cylinders and comes with an Engine Displacement of 1047 cc. The Tata Tigor has a Turbocharger too. The Tata Tigor facelift price begins from ₹ 5.20 lakh for the petrol variants and goes up to ₹ 6.65 lakh. The diesel engine variants price begins from ₹ 6.09 lakh and goes up to ₹ 7.38 lakh. It is clear that the all-new Tata Tigor facelift is not only a Tiago with am upgradation, but it also comes with a different vibe because of its new looks. It is an appealing car and clearly has a visual charm that the normal compact sedan lacks in. In a sense, the Tigor will invite those buyer’s attention whose priority will be good design and style over practicality. It doesn’t mean that the Tigor isn’t practical. Much to the contrary, it comes with a well-designed cabin, spacious interior, and a large and usable boot. Top-spec Tigor’s also mark requirements for current day scenario with respect to features and connectivity at the same time. Where the Tigor is not that good if we talk about under the bonnet. Both the petrol and the diesel engine could have done wonder if they had more power. In fact, with respect to the handling package and good ride, the powertrain is the only area where the Tigor feels a score down to the present compact sedans. But the fact is that the Tigor will come in the category of the Tata Zest, which by the addition means it will be priced importantly lesser than compact sedans like the Ford Figo Aspire, Honda Amaze, Hyundai Xcent, Volkswagen Ameo, and Maruti Swift Dzire. Tata is supposed to be considering at an energetic price tag for the Tigor with prices acceptable to begin from Rs 4 lakh and goes to Rs 6.5 lakh for the top-spec diesel. And that indicates that the marketing of the Tigor will go smoothly without any direct rivals in its way. The new Tata Tiago facelift is the best choice for those who want a good looking car with a modern style.